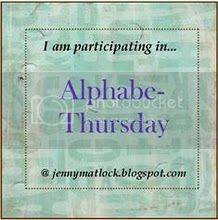 I have prepared this posting for Jenny Matlock's Alphabe-Thursday where the letter of the week is "I." You can link directly to Alphabe-Thursday at the end of this post. I have chosen to write a tribute to my wonderful Aunt Ionia and include a recipe for her Fairy Bars. After Ionia's death, one of my cousins put together a memory book about Ionia which included many of her recipes. The recipe for Fairy Bars was included in the book. I had an Aunt named Ionia. My middle name is Ionia too; I was named after her. Her name is pronounced as I-own-a. She was my dad's sister and she was a "second mom" to me. We, seventeeen nieces and nephews, loved going to Ionia's home for dinners, parties, and always Christmas Eve. She loved to bake and cook for her loved ones. On Christmas Eve, each table would be set beautifully with a centerpiece and her best dish and glassware. 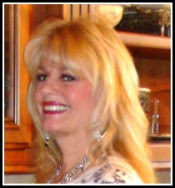 We all admired her beautiful ruby stemware at the "adult" table. I have my own set of ruby stemware because I always loved her set. She would cook the dinner by herself; she didn't allow anyone to bring anything. She prepared weeks in advance for this feast; there would be 30-40 people at her apartment. As I got older, she would have me come on Christmas Eve day to help prepare for the crowd. She made at least nine kinds of cookies and bars which she served for dessert with peppermint ice cream. After dinner, the men always washed the dishes by hand; she didn't own a dishwasher. They had great fun doing the dishes and teasing her that they were using the "decorative" towels they weren't supposed to use. After dinner, we would open presents. She had a present for everyone under her tree. She even had a few extras wrapped, unless she forgot someone --- which she never did! She gave us opportunities that our parents couldn't afford or didn't have the time to do with us. Her sister Mary had ten children; after the birth of the last child, Mary's husband died. Mary never remarried; Ionia and Mary talked on the phone or saw each other every day. We would go to Ionia's home for sleepovers; she would serve donuts or individual-sized cereals for breakfast; this was quite a treat for us! We would play cards, such as euchre or 500, endlessly. Since I was the youngest, and the worst card player, she would often have to be my partner. Even with my lack of card playing skills, we could still win. She was that shrewd of a card player! If a new restaurant opened in town she would be sure to take us there. She worked at the Ray-O-Vac factory; so she always kept us well-supplied in flashlights and batteries. As cousins, we would take turns going to the Ray-O-Vac company summer and Christmas parties. She never married, never had children, and never owned her own home. She took care of her ailing parents, my grandparents, as they passed from this life to the next. She took care of both my parents as they passed from this life to the next. After my mother died, she moved into my father's home to take care of him. She still maintained her apartment during those three to four years, but she essentially lived at my dad's home. She provided selfless, heroic, angelic service. In September of 2001 she came "out west" to visit my sister, myself, and two brothers. She said she was coming just to visit and not to tour around. She did visit, but even at 84 she had tons of energy and toured all around. My dad always said she was a "gad-about" and that she would go anywhere...even to a snake wrestling match. About two years after her visit, at the age of 86, she died on October 31, 2003. I thought it was fitting that she died on Halloween, a favorite holiday for kids since she was always so nice to kids. Even today, it is hard to not be able to pick up the phone and talk to her! These bars, called fairy or peanut bars, were in her dessert repertoire. 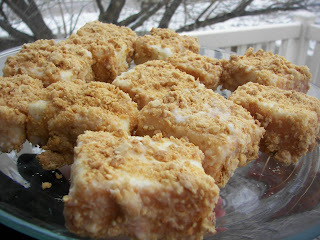 I think, since they are made with angel food cake, they should be called Angel Bars, in memory of an angelic aunt. I hope you have had someone like my Aunt Ionia in your life! Or if you haven't, that you can be someone like Ionia in the life of someone else. Cut angel food cake loaf into small squares, maybe 2 inches by 2 inches. Put peanuts in food processor and chop. Make a thin icing with the powdered sugar, milk, and butter. Dredge (or spread with a knife) the angel food cake squares in the icing and coat the icing with the peanuts. Put on a cooling rack to dry. On the cooling rack ready to be eaten! I love the contrast between the sweet icing and the salty peanuts! These sound wonderful, Joni! What a sweet tribute to your auntie. What a wonderful tribute to an inspiring woman. I have an old recipe that has this same frosting/peanut coating. 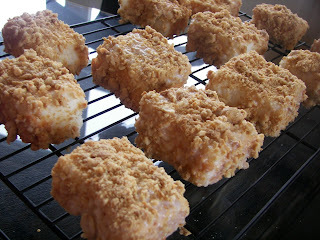 My recipe has a yellow sponge cake that you bake first, cut into bars and ice, dip in peanuts. I'd forgotten all about that recipe until I read this. I'm so glad that you have such wonderful childhood memories of your aunt. Your tribute was heartfelt and nicely written. Thank you for sharing. What a lovely story, I have tears in my eyes! You are so fortunate to have such a wonderful person influence your life. Thank you for sharing! I see I am not the only one who was touched my your sweet tribute. I too and blinking back the tears. I so enjoyed this warm and inviting picture of your family life that you so vividly described and wish that I could be just such a special woman as your precious aunt Ionia. This was touching. 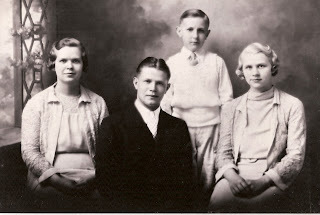 We had a favorite great aunt in my family too. She was my dad's aunt, never had children of her own, and was everyone's favorite...always sweet and always baking! The fairy bars look yummy too!! I enjoyed reading about your aunt. You were very fortunate to have such a wonderful person in your life. That recipe sounds delicious. She seemed full of unconditional love. You are all blessed to have her. What an incredible woman you had in your life! You're so fortunate. And this reminds me of my great-aunt who was a second mother to my mom when she was young. She was endlessly patient and kind and giving. I hope these women know, wherever they are, everything they gave to those they loved! Oh, and I adore that picture too! Wow. What a lovely tribute for a lovely woman. That name is like music. I was saying it outloud over and over and my husband walked by and raised his eyebrow at me. And so was your post. Thank you for sharing your story of your Aunt Ionia! What a wonderful tribute. I had an Aunt that was always there for us and she too has passed on. What a treasure of memories you have of your Aunt Ionia! Thanks for sharing them with us. The Fairy Bar recipe sounds delish! oh gee what a wonderful tribute to a very special person in your life ... i loved reading this ... and the recipe looks wonderful! Your aunt's recipe looks wonderful. What a wonderful aunt you had. And so many memories for you. Thanks for sharing the recipe. these bars sound dreamy...but more importantly your aunt sounds like a wonderful person and just what anybody wants in an auntie. How lucky you are to have had her as such a great influence in your life! What a special woman and wonderful memories of her. 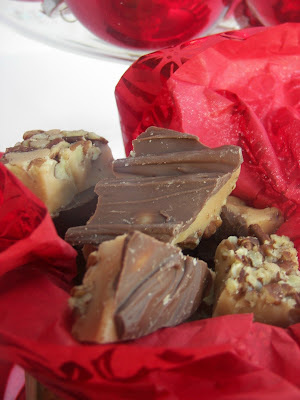 (Yumm, Iona's Fairy/Angel bars sound great...thanks for sharing this).